I found this one in an old sketchbook. I can't say with absolute certainty, but I'm pretty sure this was probably done before the first animated series was produced, quite possibly during our first visit to Fred Wolf's offices. As much as I loved the new series, all of the mutants with personalities are something I definitely missed. While I can see why they(other mutants) weren't added (and not even Rocksteady & Bebop) I do think mutants with personalities add allot more to the series than say random mutated monsters the turtles just destroy and that's the end of them. It broke my 12-year-old heart when I saw a trailer for TMNT II and was super excited for (what I was certain was) Rocksteady and Bebop, only to see the movie and find two totally unrelated mutants! Hey Peter, What did you guys think of the 'bent knees' look that all old cartoon characters had at the time, starting with He-Man? The purpose of the bent knee look, was to make it seem like the characters where 'ready to spring into action'. But now adays, all it does is to make them look like they have super bad posture. Oh, BTW, when can you guys spill the beans about the new animated DTV movie? Oh, and what's your current public email? Is it still planetracers one? I love the bent knees look personally. Makes them look more scrappy, I always attribute my love of bent knees to Wolverine for whatever reason. Miserable Dreamer: Your dad is awesome. I remember wishing it was Bebop and Rocksteady in TMNT 2 as well, but Tokka and Rahzar didn't disappoint me, they turned out pretty cool. I always forget to comment on the art after reading the comments afterward. This is an awesome picture and I've saved it to my hard drive. It's really awesome to see the initial designs of characters. 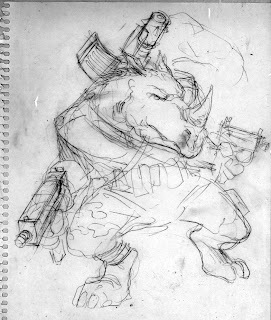 Rocksteady stayed pretty true to this design. -->> one of the most powerful Rocky stances i've ever seen..
..sorry , A.. TMNT ii, Tokk, and Rahz may have broken some hearts .. but some of us ..it lit the wick on those hearts. Inadvertently .. those fond memories are thru' my father also. A man can dream, can he not? The purpose of the bent knee look, was to make it seem like the characters where 'ready to spring into action'. But now adays, all it does is to make them look like they have super bad posture." "Oh, BTW, when can you guys spill the beans about the new animated DTV movie?" -->> The initial Shredder, with his ( i guess designed to be menacing ) hunched over stance, and almost ' squatted legs .. i'd imagine if he was actually upright, he'd be a bit taller than the original Turtle figures. It's still puzzling why they used the Blue and Dark Violet colours for him on that fig. Tho' that version is actually pretty classic and one of my favourites. But different style guides, comics, medias reused that style as well.. and often Shredder didn't look too much colour wise like he did in the actual Cartoon show. The Toon Repaint of that figure is much better. Still the scrawny Purple,Blue Shredder is classic. I don't like the first Shredder figure either and yet this is what Playmates plans to release (or shall we say re-release for like the 10th time) for the anniversary? They should have been spending all the free time they have not making toys based on the new toon's new season to make figures for the anniversary that actually look like the characters from the old show that they're based on. Now that would be spectacular. And they wonder why Wal-Mart dropped them. -->> ..love it or hate it. The first batch of TMNT toys were what they were. Oi. Playmates faces a drastically changing landscape as far as the toy-biz goes also. With an internet presence for over 11 yuears now ..E commerce is becoming imperative to so many companies. ..or ***Hasbro's Shop offering both their regular retail products as well as collector's & Comic convention exclusives . There's really no reason to be having all this frustration hanging over TMNT fans' heads. If Playmates could just take some initiative. It would actually prove very lucrative and successful ..also giving their consumers more options. It also puts the money directly to the companies and one-ups places like ebay. E commerce .. like the Purple / Blue Shredder is here ..love it or hate it. It's important and it is something Playmates needs to embrace. I'd LOVE to have Toon accurate versions of the guys and villains as they appeared in the show..maybe a little taller to boot. Not quite 7"'s but close. If we have any sculpy artists here, this would be a great challenge to try :). I'm STILL waiting to get my first sculpy...but I'm not sure from where or what type I should get..
Oh, and a MattyCollector type website for Playmates would be a great idea, but I don't think the 'mysterious Paula' would go for it :).